News publishers are all too familiar with the fact that Google News doesn’t always do such a great job of favoring original sources in its story clusters. It is not usual to see a syndicated, aggregated or simply re-covered version of an article gain prominent visibility over the original. Today I noticed an example that is worth pointing out because you’d think Google News would be able to handle it properly. 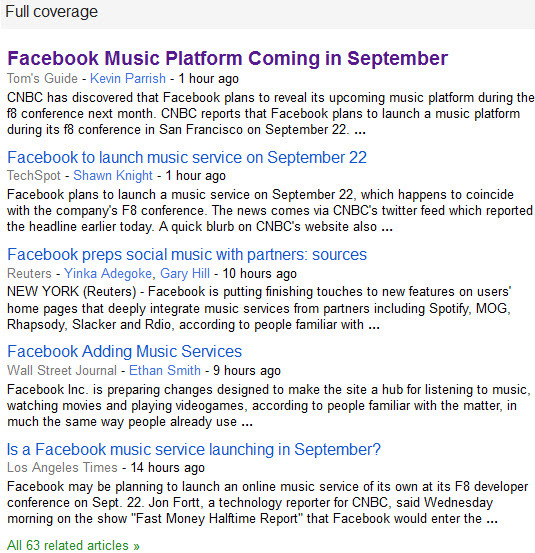 On the home page the lead article in a story cluster about the Facebook music platform came from Tom’s Guide. 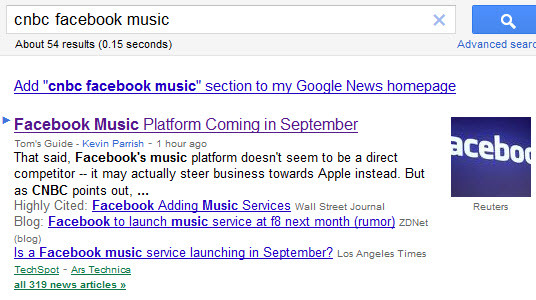 You’d think that would be a strong enough signal for Google News to favor the CNBC original over Tom’s Guide. I clicked on each of the “All X related articles” links on the Full Coverage page but did not see the CNBC article anywhere. In my post on Google News Optimization Tips I list the article ranking factors within a story cluster, in which Google specifically references that fact that it attempts to give priority to original articles and that Citation Rank is utilized to help determine original sources. However that clearly was not working in this case. Based on the story cluster ranking factors about the only advantage the Tom’s Guide article had going for it was the fact that it was about six hours more recent than the original (according to their Google News listings). The CNBC article had more tweets, Facebook likes and Google +1’s than the Tom’s Guide piece, so social signals weren’t at play either. I’m not directly familiar with either site’s SEO or news search optimization practices. 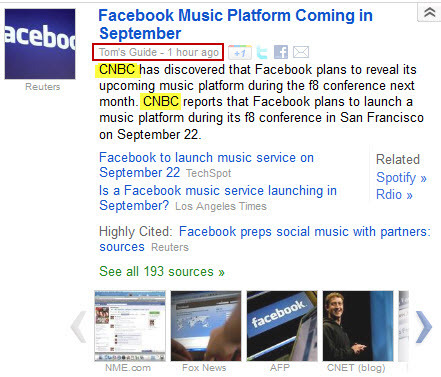 The CNBC title tag is not great but both articles have decent headlines, which is more important for Google News. Perhaps Tom’s Guide is making better use of Google News sitemaps which calls better attention to their content. But even if that were the case Tom’s Guide itself makes it abundantly clear that CNBC is the original source of the news, so you’d think Google News could account for that. Does Google News Sitemaps New Format Help Publishers? Thanks for trying to share that Jayson. I sometimes use http://www.elliotswan.com/postable/ to convert HTML code into something that can be included in a post. 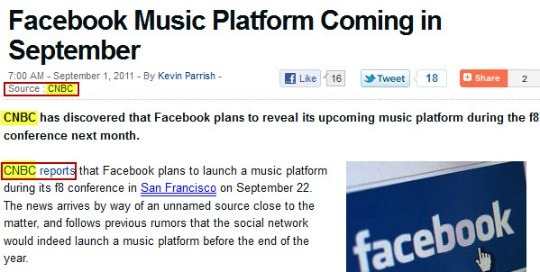 @jayson in theory they could but it’s not really in their interest, is it? And even if reputable sources do, you’ll still get the millions of scrapers that don’t. It’s a good point James, there’s not a lot of incentive for non-original sources to identify themselves as such. Google tried to get this going with the syndication-source and original-source tags http://googlenewsblog.blogspot.com/2010/11/credit-where-credit-is-due.html but to-date they don’t appear to have gotten much adoption. Great Post. I will have to agree with Jayson on giving credit where credit is due. I think if you are going to re-post and article, automated or not, you should always cite the source. Thanks Sarah. I agree on giving credit where credit is due, which doesn’t happen as often as it should. Unfortunately though even when credit is given through crawler-accessible attribution links and/or inline citations, that’s not always enough to stop a non-original source from being favored in a story cluster.